Was that a phenomenal start to the series or what? 12 Monkeys Season 1 Episode 1 quickly established its world and characters making you forget all about the feature film that inspired it. No disrespect to the classic Terry Gilliam movie, but the madness and confusion of Willis' hero has been replaced by a more focused "man on a mission" in Aaron Stanford. Ultimately, I think that creative decision will serve the series well. The trippy nature of the film was fine for 127 minutes. However, that would drive me bananas (see what I did there?) if it lasted 13 hours. 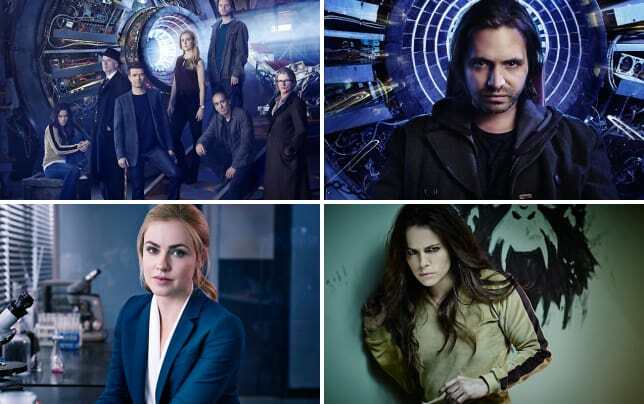 Syfy's on a roll guys... they have another winner with 12 Monkeys! The series starts off in the year 2043, which immediately tells us this is not just another rehash. Very little time is spent in Cole's future in the 12 Monkeys film. From what we've seen so far, plenty of important storylines will take place in 2043. Our hero, Cole, has had to do some very questionable things in order to survive. There's such regret in his opening monologue, we understand he'll do anything to undo history. The rewind to 2013 introduces us to the lovely Amanda Schull (Dr. Cassandra Railly) who is fantastic on this show. I completely buy her as a virologist. Now I love Natalie Portman, but Nat was terribly unconvincing as Jane Forster in Thor. Seriously, a scientist investigating wormholes? I don't think so. My point is Amanda sells it, and she's just one of several fantastic actors on this show. A desperate Cole kidnaps Cassie and that's just the start of their incredible adventure. Cole knows everything about Dr. Railly, which understandably freaks her out. Wasn't it great when he listed her accomplishments and mentioned viral containment for the CDC in 2015? She's like, hold up it's 2013. Loved that! Cole's mission seemed pretty simple at first, locate and kill Leland Frost. Assassinate the guy that created the virus and rewrite history. Piece of cake right? Ah, not so much. We have 13 hours of story to tell, after all. The watch trick and the fact Cole vanished in front of Cassie's eyes made it easy to believe she drank the Kool Aid. Brilliant that the writers didn't waste three episodes with Cole trying to convince Cassie he's from the future. Did the poor guy have to get shot as well? Of course, the injury further helped his case when Cole reappeared two years later at the hotel still sporting the wound. See what I mean about the storytelling being very focused? This series is extremely well written, which is all I ask from a great sci-fi show. It's interesting that rather than jump back and forth in time every few minutes, we also get flash forwards. In the first of these, we meet Jones, the physicist who developed the time travel technology. Jones mentions that Cole is no longer bound by time, and not even a paradox can hold him back. She also warns him that Cassie is just a puzzle piece. What does this tell me? Well, that Cole will probably bump into himself at some point and that he's going to fall for the good doctor. That's cool, just no love triangle please and thank you. The line future folks keep repeating "everyone you see is already dead" is pretty darn disturbing. I already hate the idea that Cassie inevitably dies sending Cole on his mission. Once Cole is convinced Cassie believes him, he shares the story of the pandemic. In 2017 the plague claimed seven billion lives, but he was somehow immune. The rare few immune survivors became scavengers and took advantage of all the chaos. This is the regret we heard in Cole's voice at the top of the show. He was one of those bastards. Did you catch Cole say the time travel experiment (Project Splinter) started in Cassie's time? Chances are we're going to meet some of those brilliant minds that made time travel possible in Cole's time. It was heartbreaking when Cole tells Cassie she died in his timeline, but was able to send a message which included his name. We've kind of come full circle. How cool is that? Though Cassie still had no clue who Leland Frost was, it didn't take long for her NSA pal to locate the guy; one Leland Goines. I won't comment on the Aaron Marker character yet, he just seems like a tool, but Goines was great. I hope we see more of Zeljko Ivanek despite being killed off. Anyway, Cole attempted to kill Goines at the big party but failed. This lead to the coolest scene in the pilot, the dual watch paradox explosion thing. At that point, I had no idea that Goines met Cole previously. As it turns out, the old man did have a part to play in all this. He's the one that brought the army of the 12 Monkeys to Cole's attention. Goines basically gave Cole his new mission. I can't wait to witness that meeting between Cole and Goines in 1987! How about you? I'll admit, I wasn't expecting Cole to kill Goines this early. How does that affect their interaction in the past? Or does it only alter Goines' future? Got to love that wibbily wobbly timey wimey stuff right? Either way, we'll find out soon enough. So Goines had a daughter, and we met her briefly at the end of the episode. I'm definitely looking forward to learning more about Jennifer Goines. How do you feel about the 12 Monkeys Pilot? Did it exceed your expectations? Will you be joining Cole and Cassie on this crazy time travel trip? Your turn fellow sci-fi fans, please share your thoughts with me in the comments below. I seriously love talking about this stuff. Want to see that again? Of course you do, just click > watch 12 Monkeys online to re-watch the pilot via TV Fanatic now!! !